These classical treasures provide a great segue to the holiday season as we welcome our neighbor to the south, Chautauqua Symphony Orchestra Music Director Rossen Milanov, to the podium. Saturday - Come at 7 PM to hear directly from the artists in “Musically Speaking,” sponsored by Uniland Development. Sunday - Come at 1:30 PM for “Musically Speaking,” sponsored by Uniland Development. In 2017, the Mr. Milanov was recipient of an Arts Prize by The Columbus Foundation for presenting Beethoven’s Ninth Symphony as part of Symphony’s 2017 Picnic with the Pops summer series. Mr. Milanov has established himself as a conductor with considerable national and international presence. He has appeared with the Colorado, Detroit, Indianapolis, Milwaukee, Baltimore, Seattle, Fort Worth, Symphonies, and National Symphony Orchestra at the Kennedy Center, Link Up education projects with Carnegie Hall with the Orchestra of St. Luke’s and Civic Orchestra in Chicago. Internationally he has collaborated with BBC Symphony Orchestra, Orchestra de la Suisse Romand, Rotterdam Philharmonic, Aalborg, Latvian and Hungarian National Symphony Orchestras. The orchestras in Toronto, Vancouver, KwaZulu-Natal Philharmonic in South Africa, Mexico, Colombia, Sao Paolo, Belo Horizonte and New Zealand Symphony Orchestra. In the Far East he has appeared with NHK, Sapporo, Tokyo, Singapore Symphonies, Hyogo Performing Arts Center, Malaysian and Hong Kong Philharmonics. Mr. Milanov has collaborated with some of the world’s preeminent artists, including Yo-Yo Ma, Itzhak Perlman, Joshua Bell, Midori, Christian Tetzlaff, and André Watts. During his eleven-year tenure with The Philadelphia Orchestra, Milanov conducted more than 200 performances. In 2015, he completed 15-years tenure as Music Director of the nationally recognized training orchestra Symphony in C in New Jersey and in 2013 a 17-years tenure with the New Symphony Orchestra in his native city of Sofia, Bulgaria. His passion for new music has resulted in numerous world premieres of works by composers such as Derek Bermel, Richard Danielpour, Nicolas Maw, and Gabriel Prokofiev, among others. A passionate chef, he often dedicates his culinary talents to various charities. 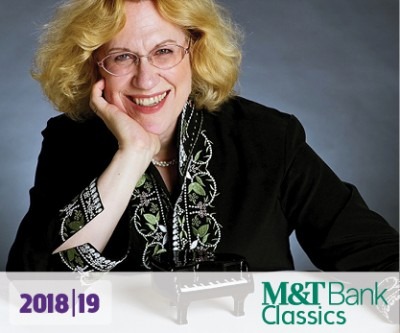 Noted for her musical command, cosmopolitan artistry, and visionary independence, Sara Davis Buechner is one of the most original concert pianists of our time. Gold Medalist of the 1984 Gina Bachauer International Piano Competition. unique collaborations with film and dance (including tours with the Mark Morris Dance Group, and Japanese kabuki-mime-mask dancer Yayoi Hirano). Busoni “Goldberg” Variations). Stereophile magazine selected her Gershwin CD as “Recording of the Month,” and her interpretation of Hollywood Piano Concertos won Germany’s coveted Deutsches Schauplatten Preis. Most recently her recorded traversal of the score to Carl Dreiser’s silent movie classic Master of the House (1925) may be heard on Criterion Collection DVD. As a proud transgender woman, Ms. Buechner also appears as a speaker and performer at important LGBTQ events, and has contributed interviews and articles about her own experience to numerous media outlets. Sara is a dual American-Canadian citizen who makes her home in Philadelphia.